Vital buses are transit buses that are typically chartered for long trips, although some of them do have other uses within the transport company. One may not think of how often a transit bus may sit at idle, but similarly to city buses, it may sit for long periods of time while passengers exit and board the bus. Additionally, these transit buses also sit at idle for long periods while in the station. Next, think about the electrical load that a Vital transit bus alternator needs to maintain while sitting in these idle periods. Much more than regular passenger cars, trucks, or SUVs, transit buses have electrical uses such as wheelchair lifts, marquee lighting, bicycle lifts, and so on. Therefore, the electrical load that a bus needs to maintain at idle is high. 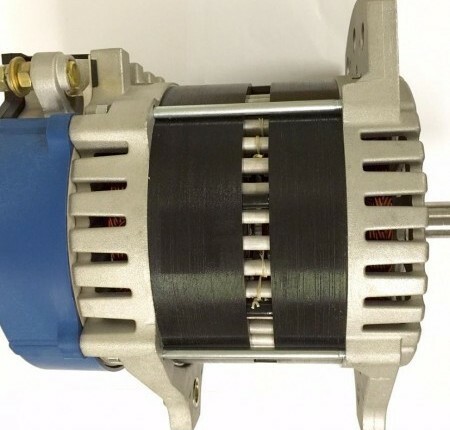 Because of this, most Vital replacement alternators are high output alternators, meaning that they can handle large electrical loads. Many of theme can hold up to 500 Amp loads, but this comes at a price. The whole of all of these Vital replacement alternators are high output, high RPM. This means that while the alternator can take a heavy load, it puts extra strain on the engine. Eco-Tech supplies a more economical, environmentally alternative. Alternators made by Eco-Tech satisfy the need for high output, but also at low RPM. What does this mean in the long run? There is less wear and tear on the engine, and on the alternator itself. Additionally, no extra components need to be purchased, such as high idle devices, load shedding devices, and multiple battery packs. Also, many of these competing high output, high RPM alternators do not nearly meet the Amperes they claim to. For example, a stock Vital alternator rated 320 Ampere may deliver only 85-90 Amperes at idle, while the Eco-Tech version delivers three times that. The most convincing reason to make the switch to Eco-Tech alternators is the money saved on gas. Not only does this reduce the carbon footprint, this saves the end user thousands of dollars per year. An Eco-Tech alternator, when compared to others, eliminates the fuel penalty by 52 percent, making Eco-Tech the most obvious choice.